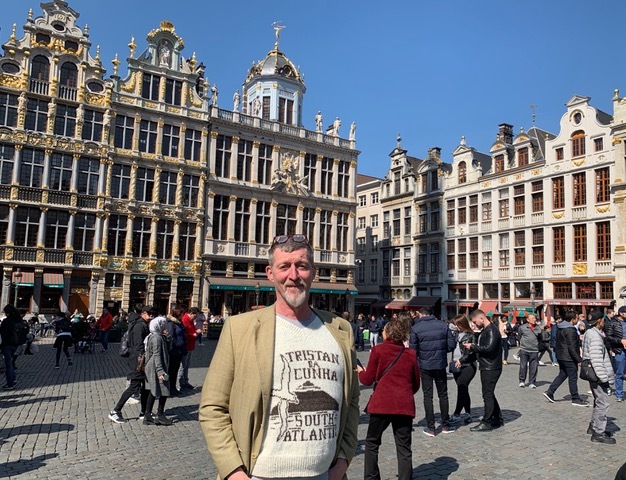 ﻿ Tristan da Cunha Store News: A new sweater in Brussels! Happy customer Jan Bultheel shows off his bespoke Tristan sweater in Belgium. A new sweater in Brussels! My sweater finally arrived in Brussels. It fits me like a glove ;-) Here is a Tristan da Cunha sweater all the way from the South Atlantic on the Grand Place in Brussels! Can you thank Silvia Green. I can see there is still some Dutch neatness in her art. To order your own Tristan sweater and other 37 Degrees South products, please visit our Knitwear page.